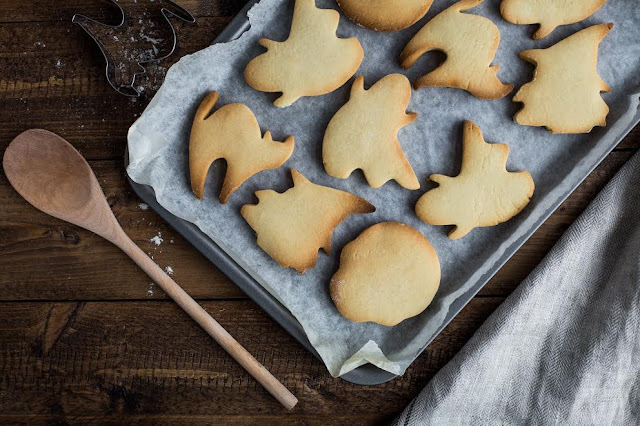 What a way to kick-start the half-term week than with these tasty Pumpkin Spice Biscuits. With the house chockablock full of pumpkins ready in time for the Halloween festivities, I felt it was a shame to dispose of the yumminess inside. Not one to waste, I hit up Pinterest for some inspiration on what to do with the fleshy beauties now scraped out of my pumpkins and decanted into a mixing bowl. I've never made biscuits before, not from scratch anyways, well unless it was a ready made pack where technically I had made it from scratch as I did add an egg, water and splash of water, so basically I can say I've made them from scratch before?! Ok, ok well that's a totally big fat whopper of a lie, but my nephews always think they are my own creation lol! Now, this took me a few attempts to get right, but I got there with a little helping hand with Steenbergs Pumpkin Pie Mix. I stumbled across Steenbergs actually on the Amazon website, as I wanted to add a little something to my Pumpkin Spice Biscuits. Amazon had a lot to offer, but all products of interest were coming from America. I am a firm believer of supporting my country, not to say that I don't love overseas brands as much, but delivery was a lot quicker, as well as Steenbergs being an organic fair-trade company and I love supporting and buying brands that give back. I had a little helper in the form of my little Cha-Chi and I have to say, that I loved and surprisingly enjoyed baking with her, I thought the kitchen was going to be completely destroyed and I'm happy to say it wasn't at all. I've made cakes with her, but there felt like baking these Pumpkin Spice Biscuits, brought us closer together. I think it's brilliant for us parents to bake, or make something from start to finish with our children and to just see the excitement in their eyes in seeing their creation come to shape is great. These soft melt in the mouth biscuits, are a true beauty and honestly didn't take no time to make, let alone prep. I think we got about a good 12-15 made out of this recipe, I'm sorry I should have known, but the smell of these beauties filling up the house, as soon as they came out of the oven, Leanora and I literally attacked them, luckily I was able to bag a picture or two before we finished them . So lets get to it shall we, I'm sure you and the kids will be raring to go making these this half-term or for your Halloween party this coming weekend, or just a nice little tea time treat, washed down for us adults a great cuppa of your fancy, I'm a coffee kinda gal and milk or hot cocoa for the the kiddos. FYI not great on all that measure weight jazz, hence only cups, tea or tablespoons are used! Also as a side note, I recently broke my blender, so if you know of any great makes and models, let a mumma know?! 1. I waited for the butter to soften and mixed crazily with the sugar in my mixing bowl. 2. I mashed my pumpkin or if you have a blender give it a quick whiz. once softened then add to mixing bowl along with your egg, vanilla, pumpkin pie mix (or cinnamon) baking powder, baking soda and flour. 3. Take your biscuit mix and roll it out, I didn't have a rolling pin, so just used a jam jar (must remember to buy a rolling pin lol) if you are like me, just use any jar you have in the fridge or cupboard. 4. Grab your biscuit/cookie cutters (similar) and hack away and place on parchment paper and bake for 10-12 minutes at 350 degrees. 5. If like Leanora & I and can't wait to tuck in, enjoy! If not then frost accordingly! I hope you enjoy these beauties as much as we have. If you end up making these badboys this half-term with the kids then don't forget to tag me in over in Instagram or Twitter . Don't forget to sign up for the blog for all the latest and join our Facebook page. Have a spooktacular week guys.